I risk hurting some feelings and opening a door for argument, because this is happening here is South Bend and people I know are friends on Facebook with the person doing this. I hold that door open, but will likely not participate. DON’T MISS OUT ON THIS OPPORTUNITY TO CONNECT WITH YOUR DIVINE GUARDIAN ANGEL! THIS CLASS CAN CHANGE YOUR LIFE! Everyone has Guardian Angels who are with you in this lifetime watching over you since you were a small child. Sometimes Archangels will come in when we most need their strength and guidance during particularly trying times in our lives. Your Angels want to guide and connect with you, after all, they love and watch over you daily. When you connect with your Angels, Miracles can and do happen. Do you want to know what your Angels have to say to you? Just saying… when I need “Help with struggles or answers…” I am going to pray to God in the name of Jesus Christ. 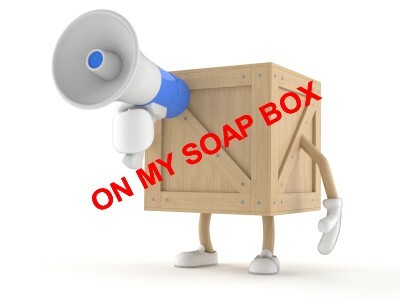 Now, I will step down, pick up my soapbox, and walk away…. ‹ PreviousI Pity the Fool!